Who would have thought my single-panel wedding invitations (in regular-size rectangular envelopes) would require extra postage once stuffed with the response card and that envelope? It’s a good thing I had the invite weighed at the post office prior to buying all 42-cent stamps. 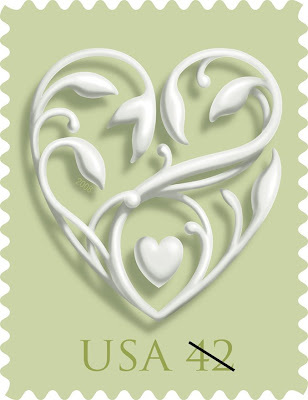 It’s a good thing they make these pretty 59-cent wedding-theme stamps — same design as below, but 59 cent postage and an ivory/beige color.